Don't worry though, we will still be hosting our big event at THE SHOP SODO! ​Check your battery, add some air and dust off your ride ! It's been a long hard winter and next week it's time to take to the streets and exercise your freedom again. Backfiremoto number 84 is the Spring Opener and the weather is looking decent. PLEASE help spread the word by sharing this with your friends. It really helps! Backfiremoto Spring Opener Year Eleven, event #84. 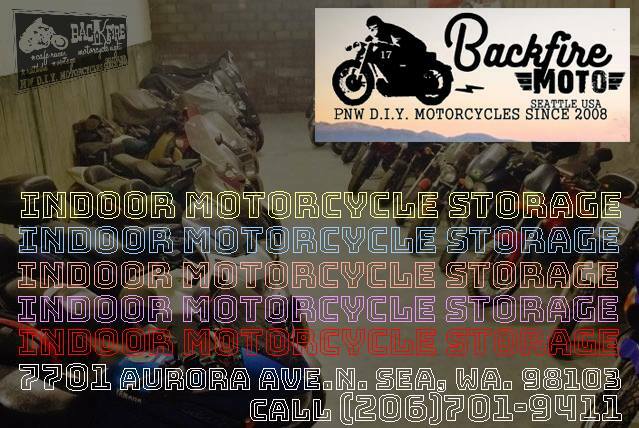 Rain or shine, All bikes welcome, 4pm-10pm March 20th 2019 , @ The shop 2233 6th ave. South in "SODO" . BREAKING NEWS! 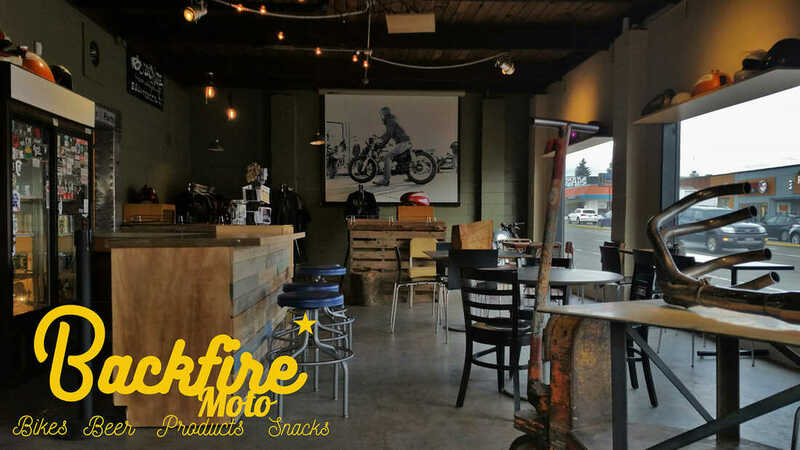 We are proud to announce that Backfiremoto has secured a Moto-friendly building that is centrally located on Aurora Ave. N. near Greenlake. Eventually, it will house a small cafe and a facility to hold smaller events and shows. (we will still be having our Premier event in Sodo as usual) Presently , we are offering a much-needed Seattle service in one part of the building. INDOOR MOTORCYCLE STORAGE. Please share this to let your friends know about the service. We offer reasonable rates and they go towards a great cause. 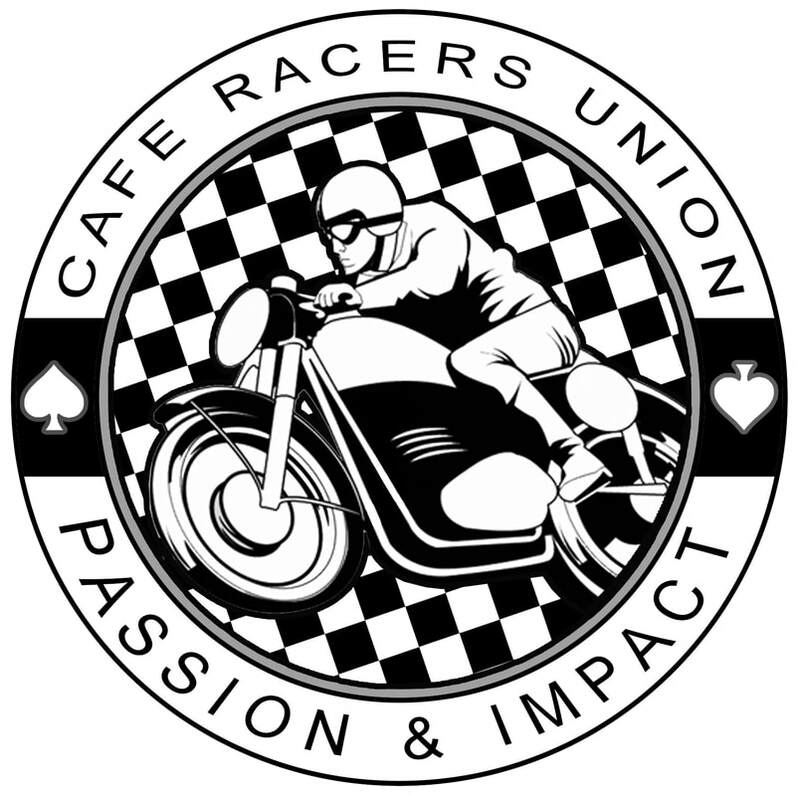 CLICK ON THE LINK BELOW to learn more and or reserve a dry, safe home for your motorcycle /scooter. Thanks and stay tuned for more info as it develops! 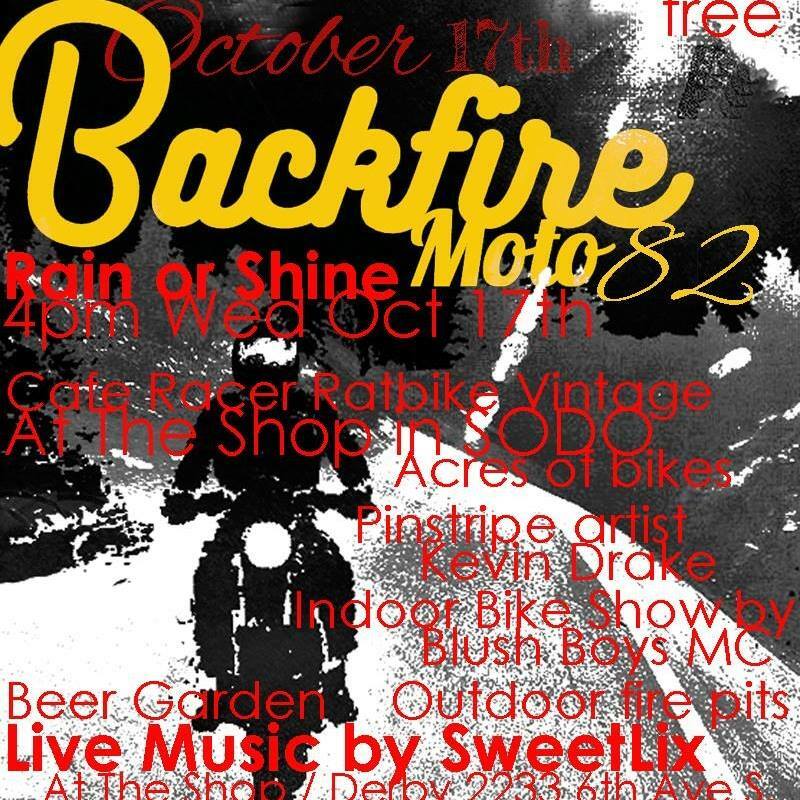 Backfire Moto is on for Wednesday, November 21st, 2018! 2. Charity donation... bring a non-perishable food item to donate and get $1 off beer. Food donations will be given to the Georgetown Food Bank. 3. Shop for the holidays and get 15% off merchandise at the event... we never have a SALE so take advantage! 4. Covered outdoor beer garden with fire pits. 5. Plenty of parking for those of you who want to drive. 6. Live Music by "Shattered Grid" . 8. Come and tour The Shop's private car collection as we will open up the warehouse for public viewing. 9. Bring your relatives and friends from out of town and show them how we do it! There is nothing like Backfiremoto ! 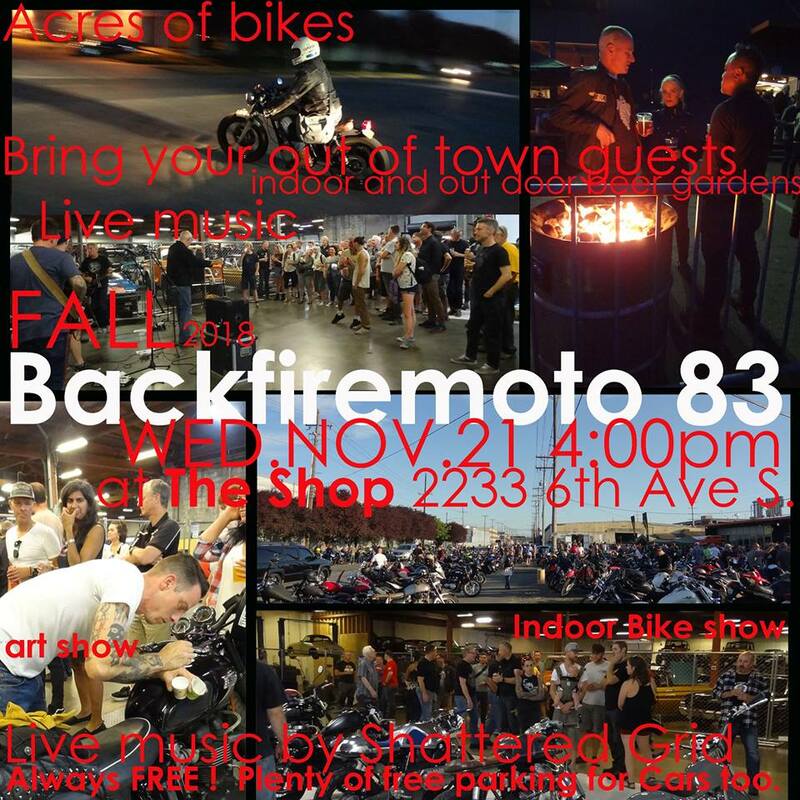 OCTOBER Backfiremoto #82 is ON !!!! The weather is clear for all next week too. It has come to our attention that some people thought that we were not holding an event this month. Not true! ..... We are going year round this year ( EXCEPT FOR DECEMBER ). So please help us put out the word by sharing this post. Wednesday, October 17th 4 pm at " The Shop " in Sodo. 2233 6th ave. S . Be sure to check out our special musical guest "Sweet Lix" in the backroom at 7pm too. See you by the fire pits! ... same place "The shop" 2233 6th ave. south in SODO..... Be sure to check out our special musical guests this month ... " The Black Planes" https://theblackplanes.com/ ... playing live at 7:30 in the back room of The Shop. 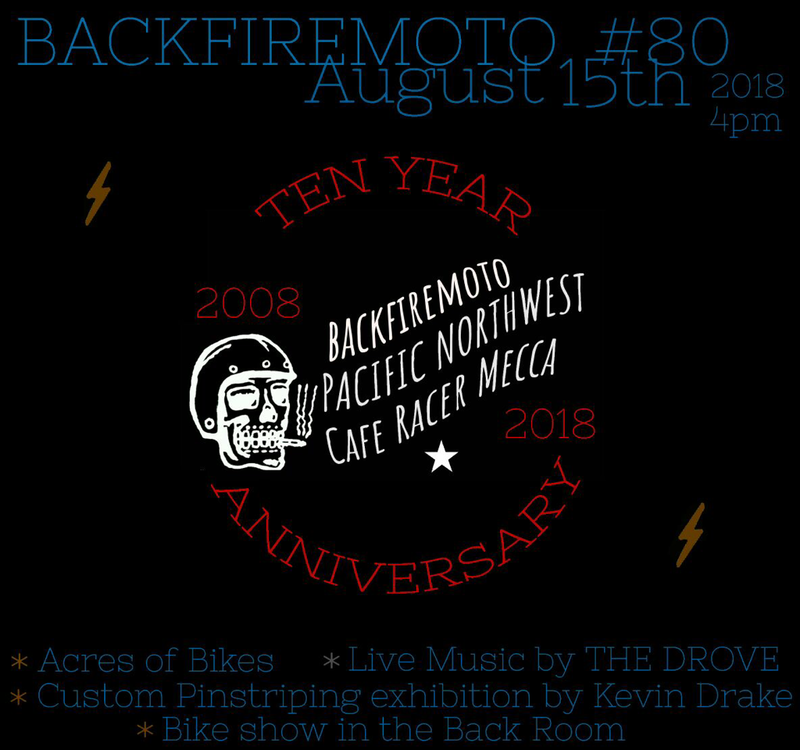 In the backroom we will also have the bike show featuring Backfire regulars. Pinstriper extraordinaire Kevin Drake will be pinstriping on site ...so bring in a helmet or a tank or roll your bike inside for a custom pinstripe job on site. 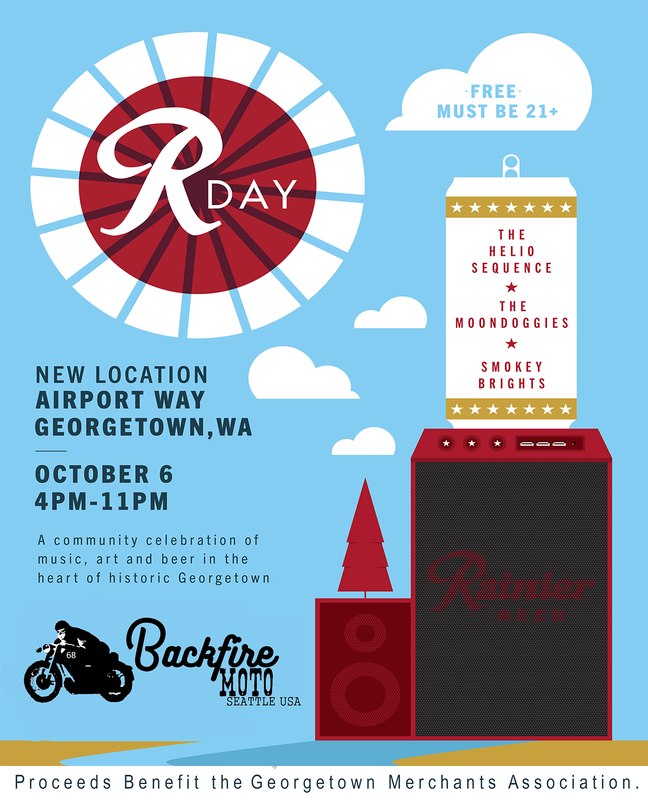 Special guests Rottweiler Motorcycle Company will be displaying what they do on site too .....The Rainier side-car will be here promoting their upcoming event in Georgetown "R-Days". Also , bring a blanket as we will be trying out our first outdoor moto-cinema as the sun goes down out front in the beer garden. Please share this with your friends and see you there !!!! 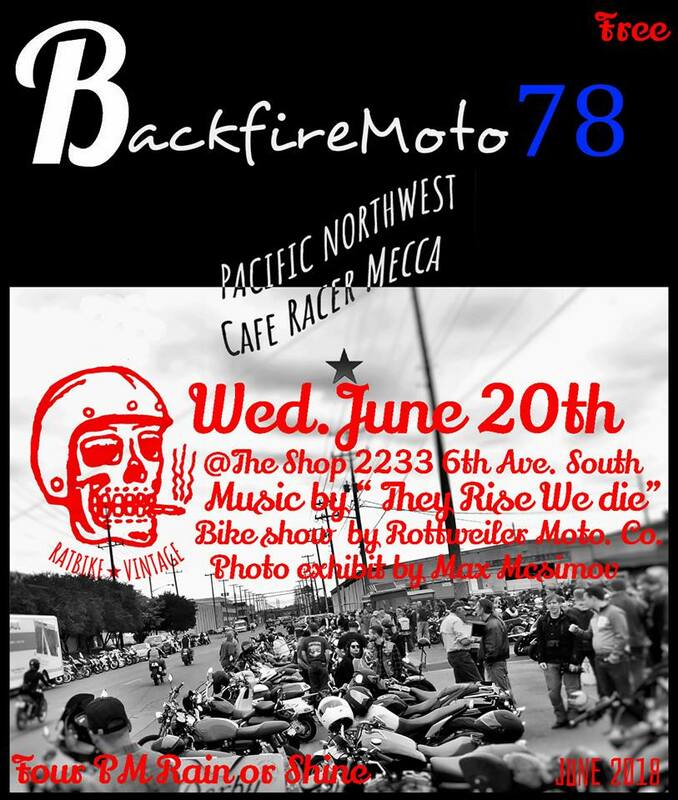 ​Backfiremoto #79 Wednesday, July 18th, 2018 4pm Rain or Shine @"The Shop" 2233 6th ave. South... SoDo District Seattle WA. This event will be featuring Live Music by Either/Or in the "backroom" at 7:30 . 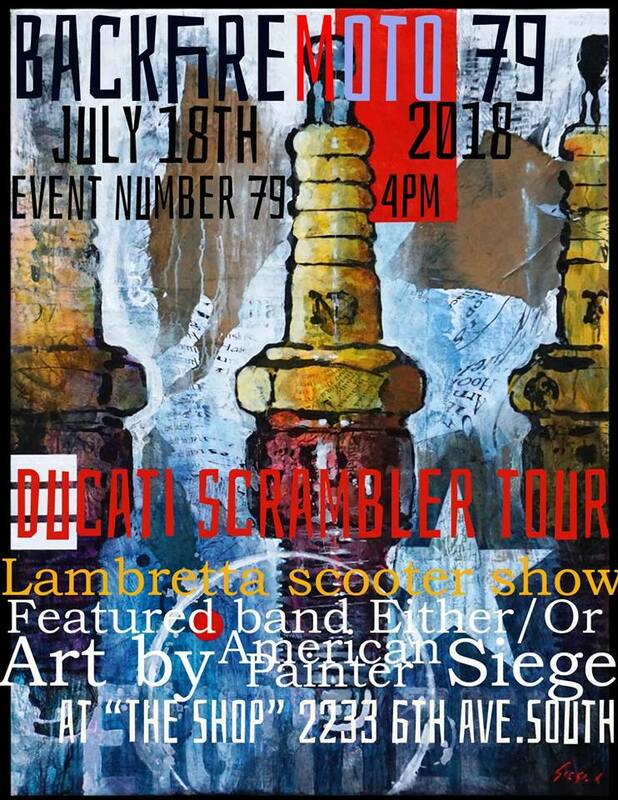 An art show with Paintings by Siege "An American Painter" A Lambretta scooter show in the backroom. And a Visit by The DUCATI SCRAMBLER TOUR Traveling schoolbus.....Great food and drink and acres of beautiful bikes! The weather is going to be excellent so put it on your calendar and please SHARE this with your friends to help us get the word out. Thanks and see you there Wednesday!!! 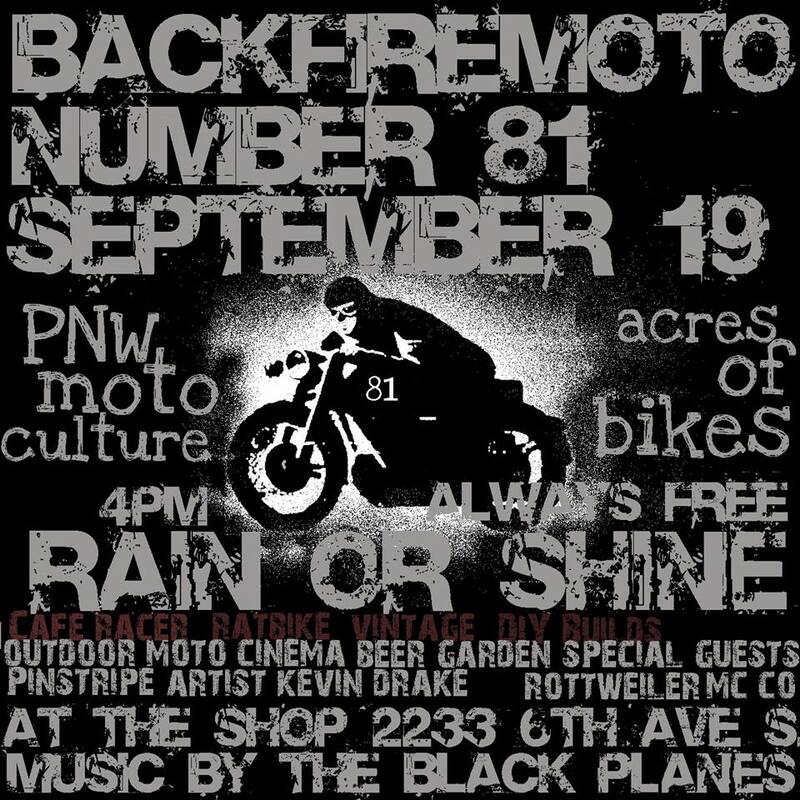 Art show by Max Mcsimov , Moto show in backroom by Rottweiler Motorcycle Co. , Acres of bikes by PNW moto-culture at its best! : ) PLEASE SHARE THIS TO HELP GET THE WORD OUT !! THANKS!